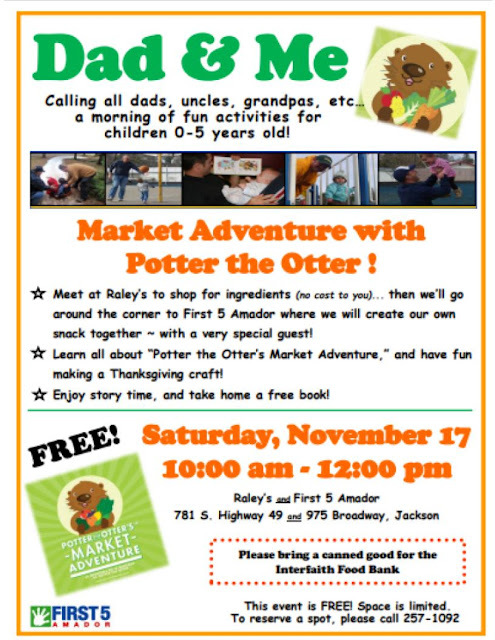 Dad & Me ~ Market Adventure with Potter the Otter! Calling all dads, uncles, grandpas, etc... a morning of fun, free activities for children 0-5 years old! Meet us at Raley's to shop for ingredients (no cost to you)... then we'll go around the corner to First 5 Amador where we will create our own snack together -- with a very special guest! Learn all about "Potter the Otter's Market Adventure," and have fun making a Thanksgiving craft! Enjoy story time, and take home a free book! Please RSVP, at 257-1092.